Yesterday I walked/ran my third 5k. Yes, you read that right, I walked. Willingly. All this past week I have had a horrible cold and spent the majority of today on the couch. But, I had registered myself and the kids for this race a few weeks ago and I knew how disappointed they would be if they didn't get to do the kids dash. Plus, I knew how disappointed I would be if I didn't at least show up and walk. My plan was to start out running and see what happened. I knew it wasn't going to be my best effort and I figured I would end up walking the majority of it. The only goal I had was to get back in time to see the kids run. When I saw the hills outside of the stadium, I made a decision. I was going to run the downhill and flat sections and walk uphill. And you know what? Even with having a cold and walking, I still finished almost a minute faster than my first 5k at the beginning of June. 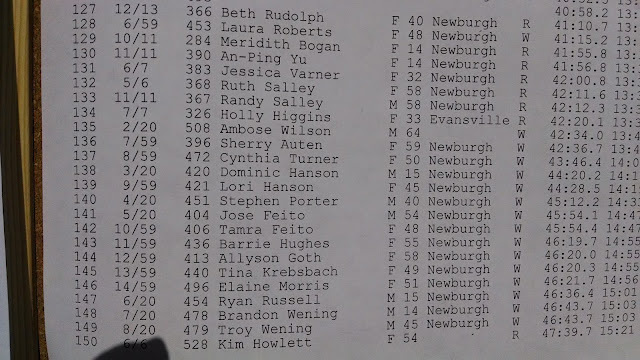 I don't care that I was last in my age group or that I was almost last out of those that registered as runners. Because I went out there and did it, even sick. I set an example for my kids by showing up and finishing something, even if it's hard and you're feeling bad. I can't wait until I no longer have this hacking cough and can get back out there full force.